The sun is shining here in the New York area. The sky is blue. And at 1:05 this afternoon, it will be right around 55 degrees. It’s opening day for the 111th season of The Legal Genealogist‘s favorite team — the team so much of the country loves to hate — the New York Yankees. And we’re playing our archnemesis, the team we love to hate, the Boston Red Sox. It’s our ace C.C. Sabathia against their Jon Lester. Statistics favor us — the Yankees have won 11 straight home season openers when the season starts at home dating back to 1986. And we’ve won two of the last three season openers against the Red Sox. Except when the National Archives gets into the act. And here’s the kicker for readers of this blog — you also have got to grab this free downloadable eBook if you’re a fan of the law. 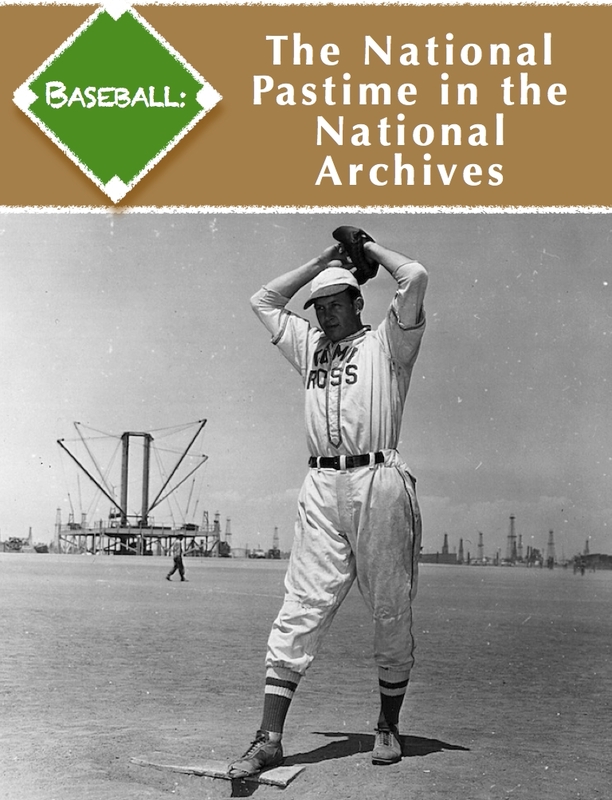 And how does Baseball: The National Pastime in the National Archives begin? With images of patents for baseball bats and balls and gloves. And what’s the next thing that Baseball: The National Pastime in the National Archives features? Photos of the baseball teams from, for example, the Chemawa Indian School in Salem, Oregon, in 1939, the Chilocco Indian School near Newkirk, Oklahoma, in 1935, and the Albuquerque (N.M.) Indian School in 1911. And photos of the 1944 baseball season at the Tule Lake (Cal.) Segregation Center and children playing baseball at the Manzanar (Cal.) Relocation Center. We all know that our ancestors had to register for the draft in World War I — the law said so.5 So wander through the pages of Baseball: The National Pastime in the National Archives — and the draft registration cards of George Herman Ruth — better known as Babe. And Ty Cobb. And Shoeless Joe Jackson. And Charles Stengel — better known as Casey. Civil rights an issue you’re interested in? Baseball: The National Pastime in the National Archives follows Jackie Robinson’s presence in national records from his acquittal in a 1944 court martial on charges of refusing an order to sit in the back of a troop bus all the way through his activism and correspondence with Presidents Eisenhower, Kennedy, Johnson and Nixon. You can download this free book in two flavors: for the iPad and for iPhone, Android, Nook, SONY Reader, other mobile device or eReader, or PC or Mac (an ePub file, 53.6MB.) I personally use the free program Calibre to read EPUB format books on my computer. It’s fun, it’s free, it’s laced with the law. I definitely understand the joy of anticipation on opening day (sorry for your loss). I also love being able to combine my passions. In August this year I will be visiting Boston for the International Association of Jewish Genealogical Societies conference. A few days ago I checked the Red Sox schedule to see if they’d be in town (perhaps I’d attend a game with my Boston cousins). Not only are the Sox in town, but they’ll be playing my beloved D-Backs. Ha! Will have to get tickets! Good luck in getting tickets… and I always root for anybody who’s playing against the Red Sox! Even we Red Sox fans are fans of Judy and all her knowledge… I won’t let that unfortunate Yankees thing get in the way of taking Judy’s advice, and will definitely check out this book !